OK, so I'm finally started to see a difference in the types of products that I'm reaching for most, at the moment. 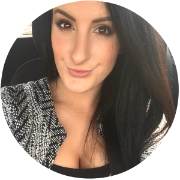 No longer am I picking up darker hues, but I'm switching them for brighter shades of makeup. 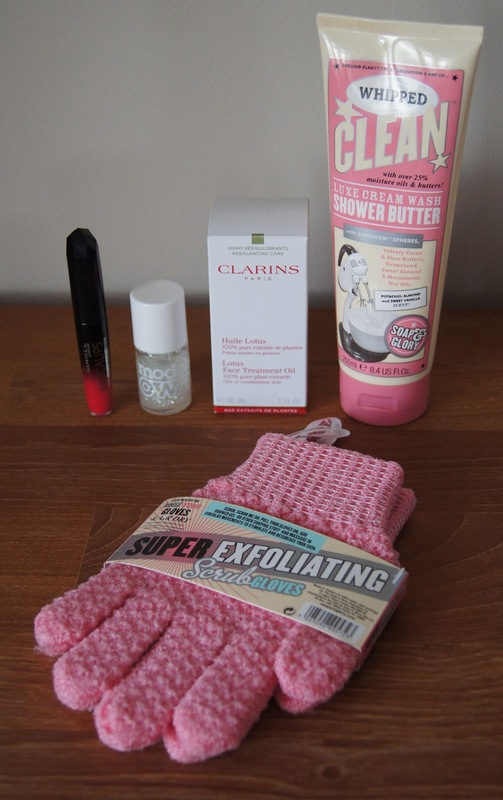 In preparation for the coming Summer months, I'm on a quest to really get my skin looking as good as it can, slathering on as many moisturising products as possible and buffing away the effects of Winter. Don't get me wrong, like pretty much everyone else on the planet (including many guys that I know...shhh), I adore Soap & Glory. But, after a recent sniff session in Boots, I was left slightly underwhelmed at some of the newer products and their fragrances. So many people rave on about the Sugar Crush scent and I, too, cave at any mention of mojitos, but it just left my nostrils a bit nauseous. Initially, the smell of the Soap & Glory Whipped Clean Shower Butter wash also made my face screw up, but after getting used to it, my mind changed and now, I can't get enough! Luxe cream wash? I couldn't agree more! Seriously, it's just full of buttery goodness, enriched with 25% moisturising oils, that leaves skin feeling like velvet. If you suffer from really dry skin, you may want to give this a try. But, if you have oily skin on your body or suffer from breakouts, then this may be just too much for your skin to cope with. Personally, I use it every other day, rotating it with more invigorating shower gels, but this one is a real treat for the body. Smelling of pistachio, almond and vanilla, it leaves skin with a generous helping of fragrance, that lasts all day. The thick, luxurious cream lathers up well, creating a silky foam that leaves you feeling clean, as well as nourished. One downfall of this shower butter, is that it does leave a slippery residue coating the bottom of my bath, which could be dangerous, if you aren't careful. Soap and Glory pricing is always great, as the products are such high quality, but this shower cream is more expensive than the other shower products and you get about half of the amount. However, it's ten times more luxurious and £8 is still a great price, seeing as I find it better than some high-end shower products. The transition from Winter to Spring, really takes it out of my skin. For whatever reason, it can't decide what it wants and it's always a time when my skin tends to take a turn for the worse. As I predicted, yet again, my skin was all over the place in March, being dry, oily, bumpy, clogged and as dehydrated as ever. 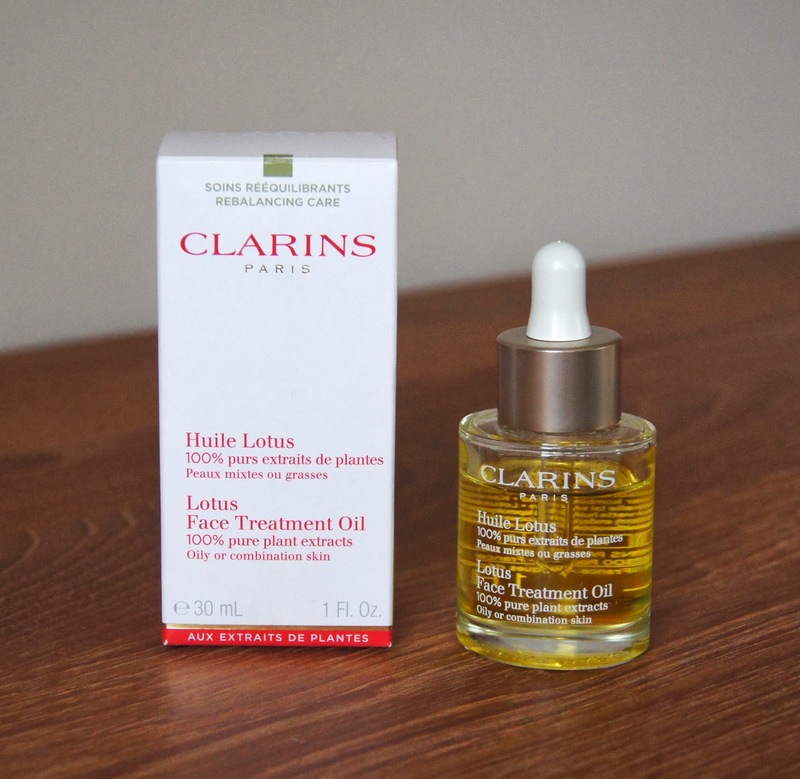 So, I turned to the Clarins Face Treatment Oil to help balance everything out. If you have oily skin, your reaction may be to run a mile from any skincare oils, but this actually helps to regulate oil production. If you over cleanse, your skin creates yet more oil to compensate for the loss, leaving skin a greasy mess, whereas adding oils, helps to even out the levels. About twice a week, after thoroughly cleansing in the evening, I like to properly massage a couple of drops into my entire face, working it in as much as possible. Of course, as it's an oil, there is a residue left behind on the skin, initially, but the face soon drinks it all up. Ingredients wise, rosewood, geranium and lotus extract help to purify and balance, while hazelnut oil prevents moisture loss and signs of ageing. In the morning, my skin feels softer, hydrated and with continued use, my skin doesn't drown in oiliness and any dry patches are evened out. Unfortunately, I really despise the strong fragrance, which is a blend of lemon and herbal smells and it does linger on the skin. Personally, my skin can cope with the added perfume, but you may want to watch out, if fragrance has negative effects on your complexion. The bottle has a pipette, which allows you to take the perfect amount of oil, without waste. As you only need a few drops per application, the small 30ml bottle will last a very long time, so even though it's pricey, you won't need to repurchase for a good while. It is a glass bottle, but the pipette makes decanting it for travelling, so easy. Finally, the Rimmel Apocalips Lip Lacquers are making an appearance on my blog! When they were first released, I picked up three of the eight shades available, including 'Stellar', a vibrant, pinky-coral colour, which is perfect for the hotter months. Seeing as the weather has finally picked up, this shade has been gracing my lips a lot, especially towards the end of March. A hybrid between a lipstick and gloss, the lip lacquers have intense, opaque colour, along with a sheeny, moisturising finish. Even through eating and drinking, they don't get patchy or fade badly. Having a creamy consistency, they feel lovely on the lips, but as you'd imagine, the longer the laquer's worn, the dryer it gets. Considering they're from a drugstore/highstreet brand, it doesn't bother me too much and I do tend to re-apply as a habit anyway, even if I don't actually need to. After wear, there is some staining left behind, but using a good make-up remover cleans it up, without the need for scrubbing. The cheap, fake, fruity fragrance of the formula isn't the best, but it isn't offensive and wouldn't put me off using them. 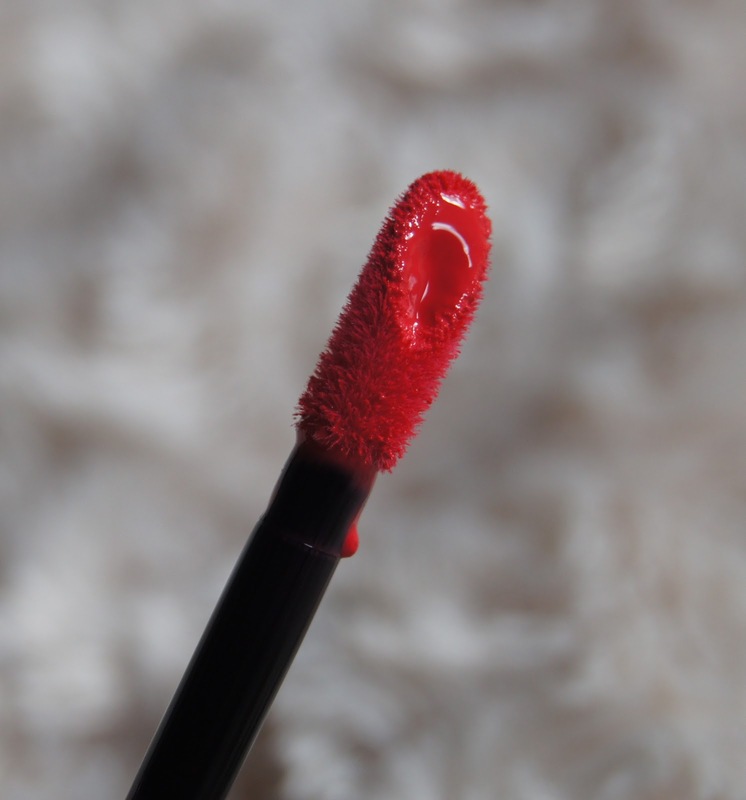 Personally, I love a sponge, doe-foot applicator for more pigmented lip products, as they allow me to be precise around the lip line, but also cover the rest of the lip quickly and evenly. The tube has a mechanism that wipes excess product off of the applicator, leaving the perfect amount on it, which avoids any messiness. Rimmel's Apocalips laquers are quite highly priced for a drugstore lipstick/gloss, but there isn't any other product that rivals them on the high street and the quality is great, so I think it's reasonable. I don't know why I've been drawn to Model's Own Snowflakes, recently. Although it's part of the Wonderland collection that ran with a theme of Winter weather, I'm just sucked into how this varnish can transform any plain shade, into something even more beautiful and special. 'Snowflakes' is a clear base containing small shards of iridescent glitter that reflects various blues, pinks and purples, depending on the light; it's just so gorgeous! The swatches above shows 'Snowflakes' layered on top of a few coats of Leighton Denny's 'Pillow Talk' and Rimmel's 'Barmy Blue'. 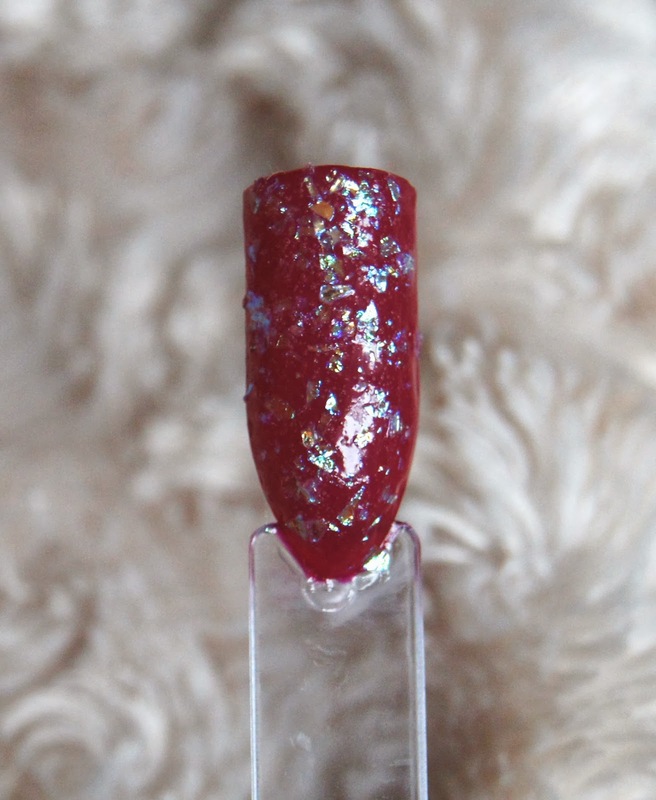 As it isn't a standard nail polish, the formula is quite thick and gloopy and it is hard to build up thin layers, resulting in a thicker finish. Also, the glittery shards don't always lie flat and can leave an uneven surface on the nail, which is annoying, but is only to be expected, really. I can handle that though, seeing as it's just so gorgeous and a good top-coat significantly helps. 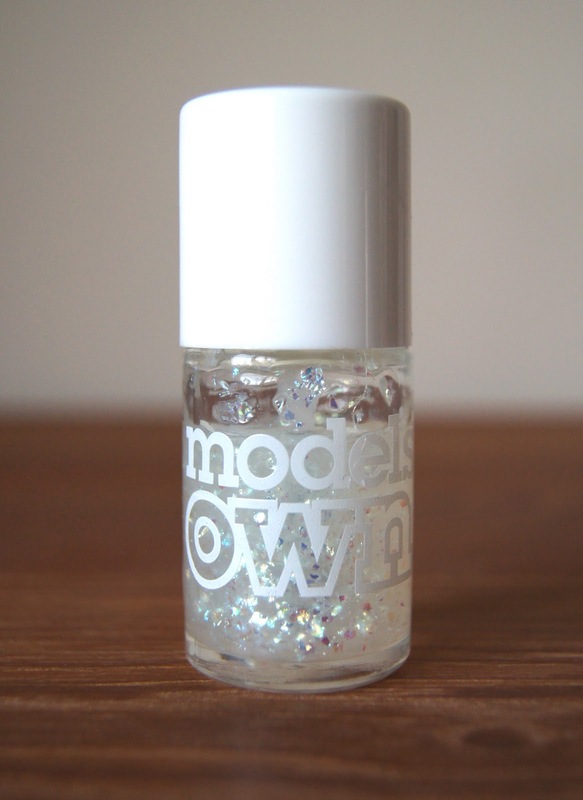 Model's Own is a brand I love for glitter polishes and this one is a cracker! I LOVE exfoliating, especially my body. I don't suffer particularly badly from dry skin on my body, but I definitely notice a massive difference after I've whipped out the exfoliation products. 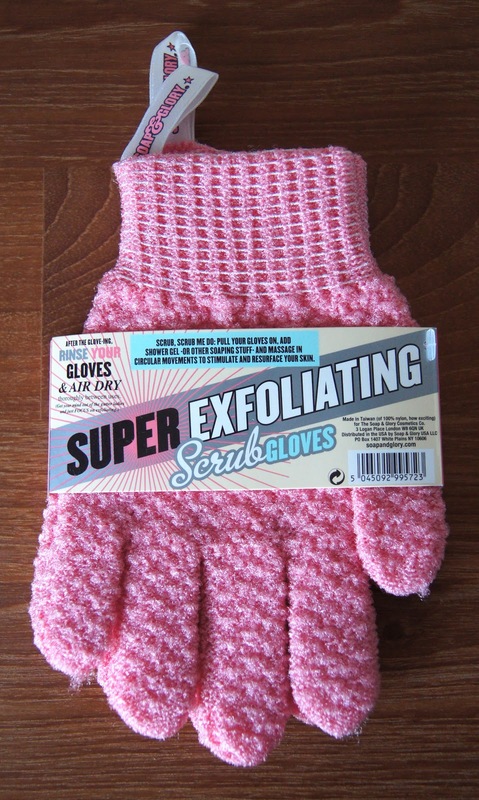 When I'm feeling in need of a good going over, sometimes a body scrub just isn't enough and I put on the Soap & Glory Scrub Gloves, for an extra exfoliating element. The material isn't at all scratchy, but if you're too vigorous, these gloves can leave skin red and possibly a bit sore. Going gently, in circular motions, works wonders. If you like, you can use them more often with any shower gel of your choice and then with an exfoliator, for a real treat. Plus, who can resist the girly pink colour? These gloves are ideal for getting you body Summer ready and are perfect for ridding skin of any remnants of faux glow, before reapplication. You do have to make sure that you let the gloves dry after each use and wash them occasionally, so that any pesky bacteria don't set up home in them. Before picking up a new pair, my previous set lasted for around a year and stayed effective for the whole time, before they got a bit old and discoloured. £4 is a complete bargain in my eyes! Which products were you loving throughout March?